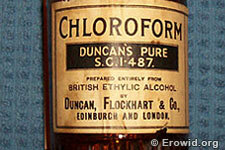 Chloroform is a volatile liquid that was used as an anaesthetic during the late 19th and early 20th centuries. soothing, quieting, and delightful beyond measure." Dr Snow invented chloroform inhaler and delivered her child.